I wasn’t ACTUALLY being naughty. Well, maybe I was. Here’s what happened. I think lots of noise and color and interesting things are fun — don’t you? They get monkeys like me excited. 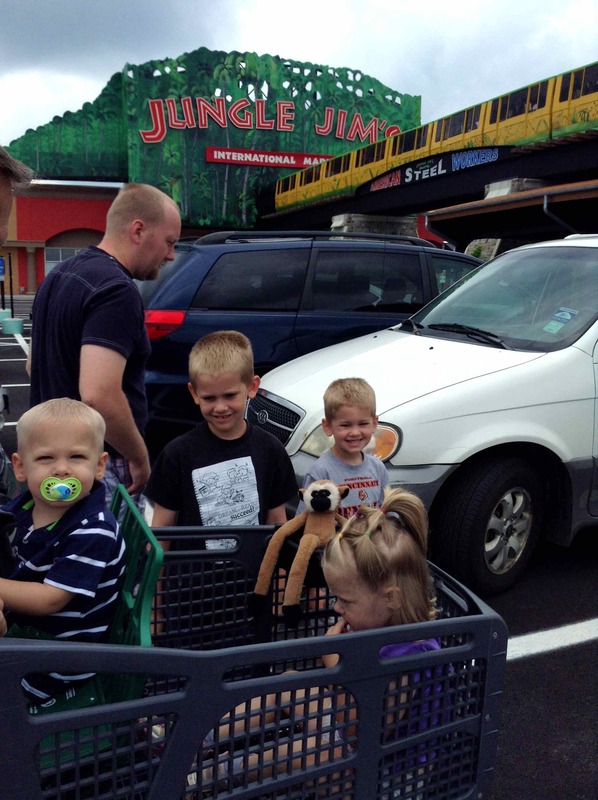 When Grandma and Grandpa and I went to the Jungle Jim grocery store, I was crazy excited! I thought going to the store would be boring. Was I wrong! This store didn’t even look like a grocery store. It had a big jungle-looking sign and a train that came right out into the parking lot. Inside was even better. There were all kinds of food from all over the world. The best part, though, was the decorations. Wow, I thought, I am going to a place where they drive cars on the ceiling! 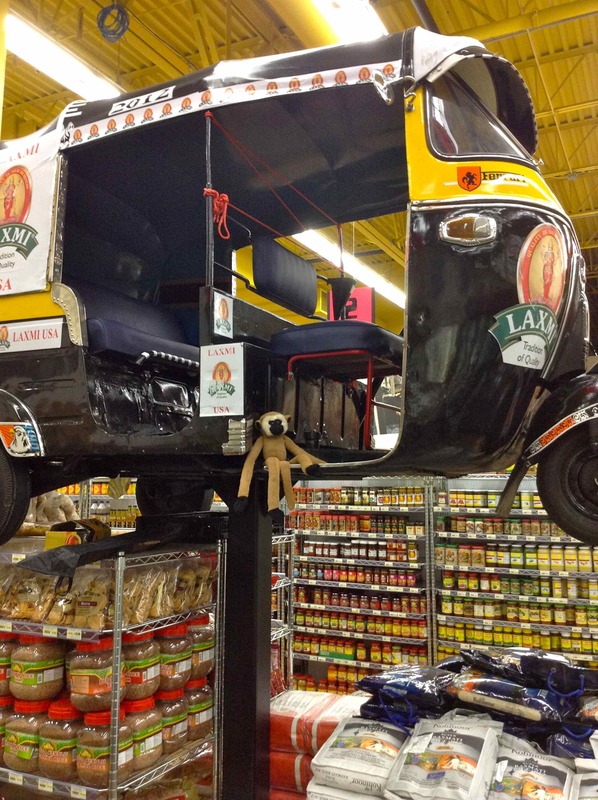 I jumped out of the cart and scampered up to the tut-tut. I knew I would be able to drive it. Decoration. That’s no fun. I wanted to drive it. I climbed down and got back in the cart. It seemed boring now that I had been thinking of driving on the ceiling. Then I saw something else on the ceiling — a fire truck. I LOVE fire truck. Grandma said I couldn’t climb on the tut-tut, but she didn’t say I couldn’t climb on the fire truck. 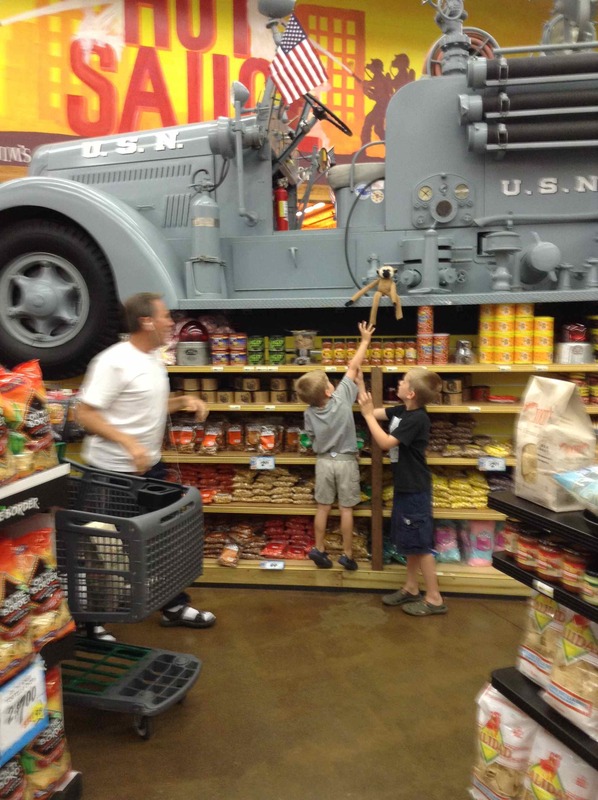 When she was busy looking at some fancy teas, I slipped out of the basket and climbed up the shelves to the fire truck. It was so cool! I couldn’t drive it, but I pretended I could. I explored the whole thing. Grandma didn’t miss me. My friends, David and Benjamine saw me, though. “Linkee, come down before you get in trouble,” David said. I pretended I didn’t hear him. I was having too much fun. Then it happened. I was jumping to the running board of the fire truck when I stopped in mid-air. I was caught! I couldn’t figure out what happened. I was just stuck, hanging there in space. I was happy to see my friend come to rescue me. He climbed up the first shelf almost as well as a monkey could. Then something happened. The whole line of shelves started moving. They were swaying back and forth and all the groceries starting tipping out. “Benjamine what are you doing?” Grandpa called. He quickly grabbed Benjamine and set him on the floor. Ben looked sad. He was going to get in trouble — because of me. And would I be left up here forever? “Where’s Linkee?” Grandma asked. David and Benjamine looked at each other. Would they tell on me? I didn’t care! I wanted down from that fire truck! Well, I guess that’s right. But I was still stuck. So that was it! The screw was sticking in my soft fabric fur. I hoped I wouldn’t get a big hole in my back. She did, and I am good as new. Well, maybe not new. I’ve had lots of hugs and lots of adventures since we started on our travels. And I really did know I wasn’t supposed to be on the fire truck. It’s hard to obey sometimes. Well — almost all the time, when you are monkey! I’m going to try to do better, though. Grandpa and I have been traveling and traveling. We are in Alabama now. It won’t be long, though, until Linkee will be having adventures in Thailand. I think he will like living at the children’s home and getting to know the children there. What did you learn from Linkee’s story today? Do you think you should just obey your parents words, or should you obey what they mean? God knows your heart, and he knows when you are obeying — and when you are fudging to get your own way. We didn’t want Linkee to get hurt, and he did get hurt when pretended that it would be okay to climb on the fire truck. Your parents want what is best for you, too! Also, when we do wrong, it doesn’t just affect us. It affects other people, too. Benjamine got in trouble because of Linkee. Someone always gets hurt when we do wrong. So obey your parents — and obey God! That’s the best way to be safe — and happy.